Is The Best Electric Chainsaw Makita, Worx or Oregon ? →The Best Electric Chainsaw- Which Is The One For 2019? The Best Electric Chainsaw- Which Is The One For 2019? In this review we’re going to look at three different models of corded electric chainsaws. These require a cord and source of electricity. There are more choices than you might think, so here’s our take on just a few, to help you find the best electric chainsaw. Electric chainsaws have some distinct advantages and disadvantages in comparison to gas-powered chainsaws. One of the benefits of using an electric model is that they are considerably lighter and quieter than their gas-powered brothers. You should still wear ear and eye/face protection, though, and take your neighbors into consideration when you use one. It makes about the same level of noise as the average power tool, such as a circular saw. But the motor only runs when cutting, so you don’t have the sound of a gas engine idling, and you don’t have to worry about gas fumes, tricky carburetors, pull cords, and all the rest of the things that go with gas engines. Electric models also stop almost instantaneously when you release the power trigger, unlike the gas models that keep on running after your cut and idle loudly in between cuts. Some electric models come equipped with chain brakes, just in case the chain should come into contact with a body part or some other item you don’t want cut. That brings up another huge issue with gas versus electric. Gas chainsaws are a good choice when you’re cutting logs or large tree trunks. But when you get to topping and limbing, the ‘bounce’ factor can come into play in a dangerous way. The spring you get with smaller limbs can catch a gas chainsaw and cause serious injury. This is one instance where a light-weight, less powerful electric chainsaw can be a much safer choice. Another plus is that electric does have good torque, which is exactly what one would expect from an electric motor versus a gas engine. Better torque with electric, better speed with gas. The big difference in most cases, though, is that you will also need access to an electric outlet or generator/ power inverter and have the proper extension cord to use with an electric chainsaw. The issue of portability with a gas chainsaw is an obvious consideration. Another factor to understand is that the electric chainsaw is not going to cut nearly as quickly as a gas-powered saw. You can expect the electric model will take longer, but not necessarily by a huge margin. Another important difference with electric chainsaws is that wet, rainy weather becomes a much bigger issue. While it’s not really wise to use any chainsaw in the rain, you can leave a gas-powered one out in the weather with minimal consequences compared to the electric models. They do not handle wet. Period. Whether or not an electric chainsaw has the same power as a gas one is pretty much a matter of opinion, and it’s colored by the user’s experience with both kinds of saw. The bottom line is really figuring out what you need a chainsaw to do for you. As always, care should be taken when using these tools and the proper safety equipment should be used at all times. Makita is a Japanese brand that has been around for 100 years, and they were the first to introduce a battery-powered hand tool. They have manufacturing plants in several countries around the world. Many of the tools they sell in North America are assembled in the plant in Germany, but this particular model is manufactured in China. Makita has well-earned reputation for innovation and quality. While you can fell some really good-sized trees with the Makita UC4051A, it is an excellent choice for pruning, trimming, and cutting firewood, too. This chainsaw is at the high end of the price spectrum, but from what buyers have enthusiastically said, they believe the higher quality is worth the higher price tag. The UC4051A has a lot of great features, but it’s a more heavy-duty model, too. Some claim this model is a specialty item not found in stores; only available online. One noted that it’s commonly used by rental companies, indicating how its durability and reliability are viewed. Benefits of the UC4051A are many. Users are pleasantly surprised at how powerful this model is. This Makita lives up to the brand’s high standard and incorporates some very well-planned features, as well. Some are more or less typical on electric chainsaws, such as chain brakes, automatic chain oilers (this one has a large view window) and tool-less chain tension adjusters; that adjustment can be done with just the twist of a knob. It has comfortable, ergonomic rubber grip handles, reducing fatigue. It starts softly, using a large trigger switch; no pull rope needed. One unique feature is a motor you can’t destroy by overheating. It’s protected from overload by the internal limiter. This will shut down the motor before it gets overheated and possibly damaged. Using the wrong extension cord is one of the most common ways to overheat a chainsaw motor. Common sense would indicate that you protect your investment by being careful of that issue, but other things, such as generator issues or cutting situations can cause problems, too. Having this feature is an excellent protection against needless loss of a great tool. Opening the box, you will find the UC4051A chainsaw, chain, bar, and scabbard. The owner’s manual is available for download on the Makita website. 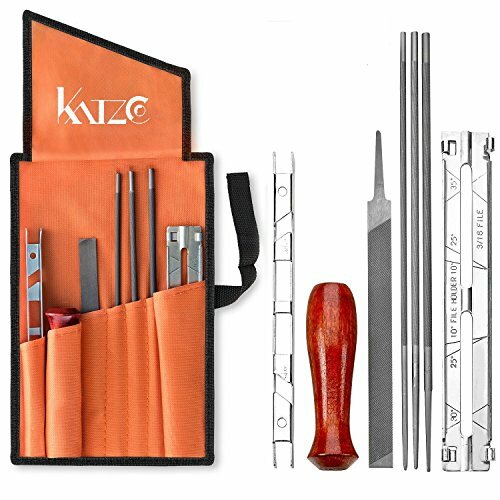 The manual is an excellent source of good information, and you will need to follow it to assemble the bar and chain onto the saw base, unless you are already familiar with that process. The UC4051A weighs about 15 pounds and measures 10 x 24.2 x 10.5. It has a chain speed of 2,900 feet per minute or 48 feet per second. The chain brake on the Makita UC4051A provides built-in protection from kickbacks, the cause of many chainsaw mishaps. In case of a kickback, the chain brake automatically stops the chain. It can also be engaged manually, if necessary. Although the chain on electric models stops almost immediately, you never know when this feature will be exactly what you need. Makita has a 30-day satisfaction guarantee, and it also has a one-year warranty against defects in materials and workmanship. There are some exclusions and restrictions, so read the warranty carefully. 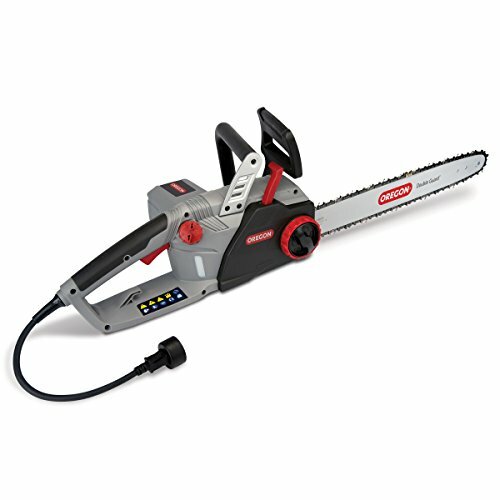 Users love the fact that this powerful chainsaw is much quieter than a gas one. They say it’s well-balanced and has a heft that gives it the feel of quality. They love that they don’t have to deal with carburetors or gas going bad when it sits in storage. They love that they can set it down between cuts and it doesn’t make noise idling, and the chain stops the minute they let off on the trigger. There’s no gas and oil to mix, no fumes, and it’s comfortable to use. Very little kickback, metal parts inside the housing, not plastic. This last item is a sign of truly high-quality. Many other electric chainsaws have at least some plastic moving parts. The amp rating on the UC4051A is 15. It’s important to use only a 10 or 12 gauge extension cord with electric chainsaws, in order to protect the motor and get the most power. The bar on the 16” is interchangeable with the 14”, if you need to make that switch. Some people have claimed to have switched the bar with other larger sizes, too, but read the warranty carefully before deciding if you want to do that. One common complaint about chainsaws in general is their tendency to drip oil. An easy fix to try is to release the oil filler cap when you’re done using the saw, then tighten it down again. This allows built-up pressure to release, keeping the oil from being pushed out of the cap. At 15 pounds, this model is heavier than some electric chainsaws, but it’s also more powerful. Some believe it truly is as powerful as some gas models. That being said, you would expect it to be heavier. It is powerful and well-made. No one seems to have a case for it, though, and that will be a consideration for some users. Of course, you do need an extension cord and power source for this saw. Use at least a 12 or 14 gauge cord; not recommended to go longer than 100’. That can be a problem, depending on the property you’re dealing with and whether or not you have a generator/inverter available. One user was very happy with this saw and his 13-amp ‘suitcase generator.’ It’s all in your expectations and needs. There are very few criticisms of this chainsaw. One was a comment about the gears; one is metal and one nylon. There were no issues reported because of that, but one person did express some concern. Some commented about the oil filler being in an awkward place. The rest of the criticisms seemed to be either related to unrealistic expectations, or user error. For the user who needs a saw that will do almost anything a gas-powered saw will do, this seems to be the one. 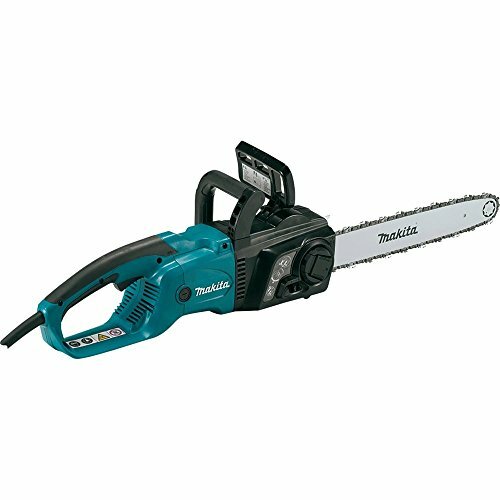 Overall, Makita electric chainsaws are very highly rated, and the UC4051A is a good example of why this is true. I would consider it an excellent example of getting what you pay for. Worx is owned by Positec, a manufacturing company based in China with North American headquarters in Charlotte, NC. Worx products are made in China and are relatively new on the market. Worx began selling their products with infomercials in 2007. Since then many home improvement stores such as Lowes, Home Depot, and even Walmart have begun selling this brand. This particular model comes highly rated, according to reviews on sites that sell it. It has many of the typical features of electric chainsaws, but here are some specifics. There are those who consider the Worx 303.1 to be as powerful as a comparable gas model. That’s the opinion of some users, not a statement from Worx. It does pull 14.5 amps and can run peak power of 3.5 hp. Chain speed is 39 feet per second. It has a manual, tool-free chain tightening system which is designed to prevent over-tightening. This also allows you to install and tighten a replacement chain without tools. Chain lubrication is automatic. There is a safety chain brake and a low-kickback bar. All-metal dogs at the base of the bar add stability. It has an easy-to-lubricate sprocket and ergonomic handles for control and comfort. It weighs about 11 pounds, measures 14.6 x 20 x 8 and is covered by a 3-year limited warranty. In the box you will find, saw, chain, bar, scabbard, a small bottle of oil to get you started, and and owner’s manual. The saw is completely assembled, right out of the box. The 303.1 uses normal household 110V electric outlets. The 2-ft cord on the saw is not sufficient, of course, and there are a number of recommendations for length and gauge of extension cords to use. Best recommendation, though, is to use a 10 or 12 gauge cord no longer than 100 feet. 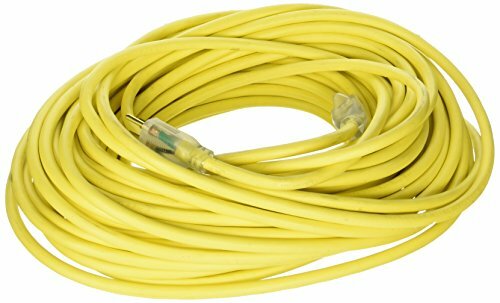 There is really quite a bit of discussion online as to what may or may not work for extension cords, because even 100 feet is also quite limiting. 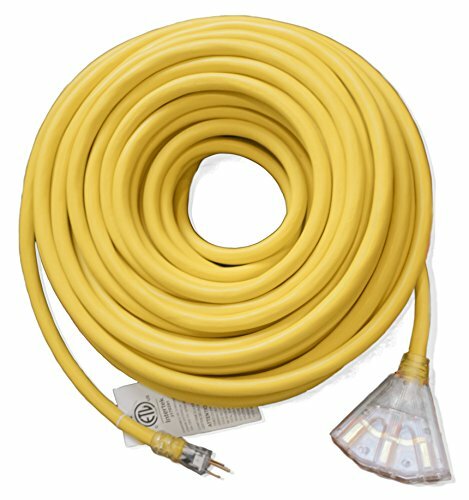 Watts Wire's Grounded 10-Gauge (10/3) 100-foot Multi-Outlet Lighted w/ Ground Extension Cords are the perfect cord all around. Our cords are designed around the contractor and perfect for the hobbyist. Our heavy-duty power cords are made with an SJTW thermoplastic which is suitable to temperatures from -40°F to 130°F. Our double jacketed cords won't mar walls or floors but will stand up to concrete! With a 14.5 amp tool, you don’t want anything less than a 14-gauge cord or lower, but keep in mind that the longer the cord, the less power gets to the machine. Without enough power, the motor can burn out and be ruined. There are those who use a generator or power inverter, as long as the output is at least 2KW; some claim that 3KW is necessary. Again, keep in mind, though, that although some feel the Worx WG 303.1 is as powerful as some gas-powered machines, it is designed for small jobs around the yard. (NOT to be used as a hedge trimmer, though!) It can be used for larger tasks, and if you read - and watch - enough online, you will find those who do use it pretty much in place of a heavier gas-powered chainsaw. However, that’s not what the manufacturer intended it for. Only a very experienced user should consider using it that way. There is also a lot of discussion about what type of oil to use. The best practice is to use only bar and chain oil. It can be purchased in varying quantities, from a quart to a gallon, and it’s not expensive. It’s made with some paraffin-type material to stay on the chain and bar and lubricate them at the temperatures the machine will generate. The manufacturer suggests using winter weight (10W) oil. If you can’t find it locally, it is available online. Some have had success with 30 weight oil or even canola oil -- canola is environmentally friendly. This could be a consideration for those who are concerned about the fact that the oil does spray a bit as the auto oiler deposits it onto the bar and chain. Most importantly, though, keep the oil reservoir filled. Worx recommends checking it every 20 minutes during continuous use. This is extremely important, as this model does go through oil perhaps more than some others, but that lubrication is essential to your saw running efficiently and cutting properly. The oil keeps the bar and chain from grinding on each other. If you run the saw out of oil, you will need to replace the bar and the chain. While that won’t be as expensive as a new saw, it’s still an unnecessary expense, if you are being careful. Spare chains are available for those who feel the need to replace, but it’s possible to sharpen your own chain using a 5/32 file and maybe watching some Youtube videos, if necessary. Hardware and home improvement stores are also good places to get your chain sharpened, if needed. One of the quickest ways to dull a bar is to get it dirty, so be very careful about cutting close to the ground or cutting something dirty. Your saw will perform much better for you if you take care of it. Although the WG303.1 is equipped with a safety brake, I have not seen any users report a kickback. This could be an important consideration for those novice chain saw users. Users say it’s well-balanced and light; easy to use for hours at a time. Automatic oiler and chain brake are favorite features, too. There are no pull-cords or chokes to fiddle with, automatic tension works well, and there’s much less vibration than with gas chainsaws. That in itself is a fatigue factor, which is important for those long days. Some users find that if they follow directions exactly for breaking in the oiling system, keeping the oil from running out, have the right power cord so the motor doesn’t strain, and keep an eye on the chain tension so it doesn’t get too loose, they can cut down hardwoods and chop them into smaller lengths without any strain on the motor or dulling of the chain. In a word, it gets the job done. If you are good to it, it will be the workhorse you need it to be. One of the biggest drawbacks to this model is the position of the safety brake. Some users noticed that the brake lever is in a position that makes it easy to accidentally bump. Sometimes the situation is made worse by wearing heavy gloves, which is really a good safety practice, not to mention necessary in colder weather, so not being able to wear gloves in order to keep the safety brake from engaging is a serious concern. Some people struggled with getting the adjustable chain tensioner to work correctly. Commenters suggested that the adjuster knob needs to be loosened, then re-tightened in order to work right. Another frustration is that there are no cases that any users reported being able to use with it. It’s quite possible there may be something available that would work, and of course, one can always get creative, but one of the convenient aspects of owning a gas chainsaw is its portability. It’s understandable that users would appreciate anything that makes the electric chainsaw as portable as possible. Another complaint, as with most chainsaws, is the leaking oil tendency. There are suggestions about storage position and loosening the oil filler cap, then re-tightening to let off pressure. And there are some defective machines, too. You will occasionally get a bad one. It happens. In that case, the best recourse is to contact Worx and see what they can do for you. They have a 30-day satisfaction guarantee and a limited 3-year warranty. A number of people reported having a bad experience with Worx customer service, while others reported an entirely opposite experience. All of us who have ever had to deal with any customer service situation know that sometimes it goes well, and other times -- not so much. Even in the worst of cases, you can often take something back to a local dealer and have them handle a customer care issue for you. Overall, most users were very happy with this electric chainsaw and the Worx brand. This model is especially interesting because it comes equipped with a self-sharpening chain. Just pull a lever on the side of the machine. Hold it down while letting the chain run for 5 seconds. While the lever is down, a sharpening stone is held against the chain, automatically sharpening it. The Oregon CS1500 is manufactured in China by Blount International/Oregon - PowerNow. It has a 15 amp motor and 18” guide bar and chain with reduced kickback for added safety. The chain is tightened without tools, however, despite a thorough internet search, I could not find its chain speed. This can be an important consideration, depending on what you are thinking you would like to do with this saw. It has the PowerSharp built in chain sharpening system, though. Handles have an ergonomic design for long-lasting comfort. The chain brake reduces the possibility of accidents. This is a low-maintenance chainsaw backed by a 2-year consumer warranty. In the box you will find the chainsaw, chain, and bar with scabbard, and owner’s manual. No gas engine issues: hard starting, flooding, tuneups, bad spark plugs, fuel filters; greatly reduced noise and vibration. Users also appreciate the textured grips and the chain brake. They feel it is easy to clean, and has plenty of power. Before first use, it’s necessary to remove the chain and bar to prime the auto oiling system. While some users found this extra step frustrating, those who took the time to do so, found that it was a great advantage to overall wear and performance. At almost 18 lbs, this is a heavy saw. That heft, though, is because it is powerful and made of high-quality components. It measures 18 x 38 x 11. High-quality components mean fewer maintenance issues and chain loosening is minimized. The 15 amp motor is powerful. You can’t get any more power out of a 120V outlet. Since it’s electric, you can use it inside an outbuilding. That’s a benefit that might come in very handy, and it’s easy to clean. One commenter noted the owner’s manual is well-written and easy to read. This might not mean much if you’ve been using chainsaws a long time, but they are all different and for most of us, it’s good to know we can get the majority of our questions answered, just by reading through the manual. This is a fairly highly-rated electric chainsaw. Most purchasers have no serious complaints. There were a number of comments about the chain cutting at an angle or ‘drifting’ after using the built-in sharpening system, but that seemed to be an anomaly with only a few units. There were a fair number who had trouble with the chain jumping off the bar. In almost every case, though, this issue was resolved, either by adjusting the chain tension or by changing how the saw was being used, for instance, not trying to cut twigs or using the tip of the chain instead of the length along the side of the bar. Of those who posted about having contact with customer service, all were very positive about that experience. One common issue that was NOT reported was oil leaking. Apparently, the design of the CS1500 has resolved that problem. There was one report of a plastic gear melting inside the motor, but again, this appears to have been an isolated incident, which was handled admirably by Oregon. The unit was shipped back to the company and replaced free of charge to the customer. That being said, plastic parts are a sign of lowered quality standards. And in relation to the chain tensioner, plastic parts can cause the chain to loosen frequently and, of course, they can also break. For those customers who did post online complaints, an Oregon rep followed up. This is a definite plus for Oregon, since most of the chainsaw reviews posted do not have customer service online responses. Overall, this saw with its unique self-sharpening feature has a lot of fans. Oregon as a company has a reputation for being responsive to customers and for it’s high-quality chains that are used by almost every chainsaw manufacturer on the market. One commenter who ultimately decided against the saw, still said it was very well-designed. It does have some issues that users brought up, but it seemed for the most part, they were either resolved or at least got a response from a company rep with an offer to help handle the problem. Whether or not they could actually fix something like the issue with the chain sharpener causing ‘drift’ or not, Oregon definitely seems to care about its purchaser’s experience and appears to want to make things right when possible. That alone goes a long way, in my opinion, toward producing a happy buying public. A really great alternative to a corded chainsaw is a cordless model.